I have been a vegetarian for 23 years, and I always seem to get asked one of two questions this time of year: 1. "What do you eat on Thanksgiving if you don't eat turkey?" and/or 2. "So I guess you eat those weird tofu turkey things, huh?" My answer to question #1 is "lots." My answer to question #2 is "no." As for the vegetarian turkey alternatives, I've tried several of them, and although I have friends who think they are the best thing on the planet, I can't get over the bizarre, rubber-like texture. They're great for some, just not for me. 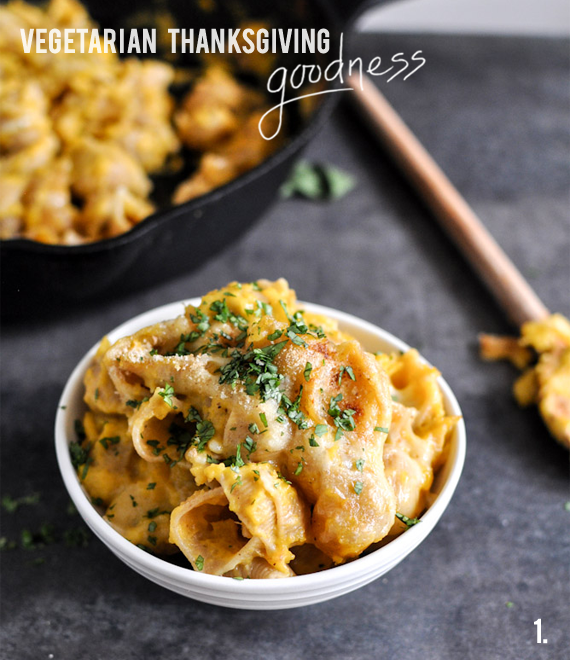 And when it comes to having non-meat options aside from turkey, I've learned to absolutely love all of the goodies that most refer to as side dishes. I see mashed potatoes, veggie stuffing, fresh baked rolls, yam, green beans and cranberries all together in one meal as a seriously awesome abundance of main dishes. With all of this vegetarian goodness, I'm definitely just as full and satisfied as my turkey-eating family members. Lucky for me, there is also the fact that desserts very rarely have meat in them. Bonus. Although I'm not much of a cook, I still love looking through magazines and food blogs around Thanksgiving. And I get especially excited when I come across recipes for unique vegetarian side dishes. Finding these types of recipes around this time of year is one of the only things that makes me feel motivated to attempt to create something in the kitchen. This is kind of a big deal for me you guys, considering that on a good day, my best case scenario is making a piece of toast without burning several slices of bread in the process. I know some of my readers are vegetarians as well, so I thought I'd share some of the delicious, meat-free recipes I've discovered over the past couple of weeks. I'm not sure which one(s) I'll make yet, but it's nice to have a little round-up of inspiration. 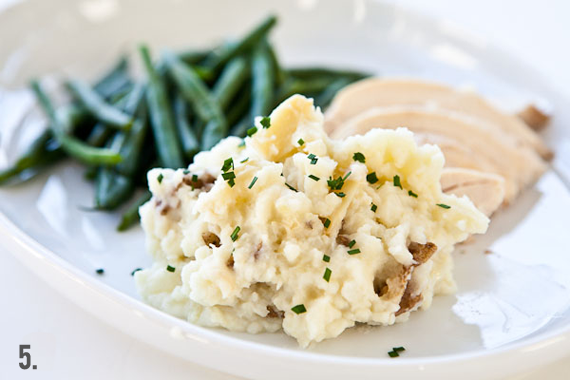 Whether you're a meat eater or not, what is your favorite vegetarian Thanksgiving dish? I am a vegetarian and I've turned mashed potatoes into the main course. I double up on those (super healthy, i know!) and load up on mushroom gravy. It's amazing and I don't feel like I'm missing out on anything. I'm not a vegetarian but I love love love mashed potatoes and sweet potatoes!!! All of these look super yummy and make me excited for Thursday!! I don't like the rubber-like texture either. I'm not a vegetarian, but I've tried some of the foods. 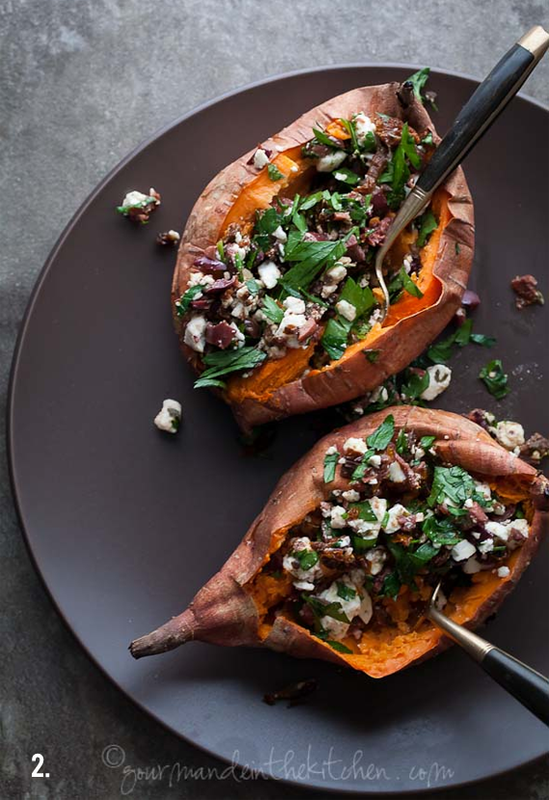 All of these side dishes look absolutely amazing! 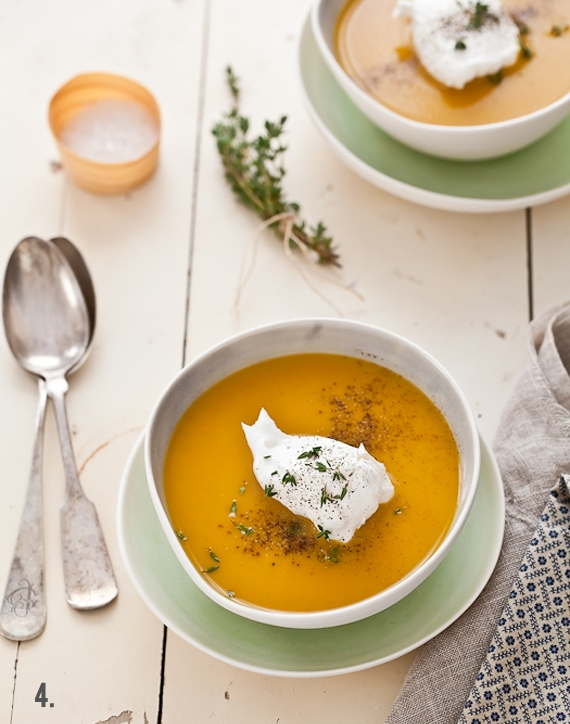 I'd love to try that gluten free acorn squash and sweet potato soup. MMmmmmm! Love ittt..I am vegetarian so this just looks so tasty to me! I am trying to eat less meat right now which includes eating veg on thanksgiving, so this is great! Everything looks delicious. p.s. 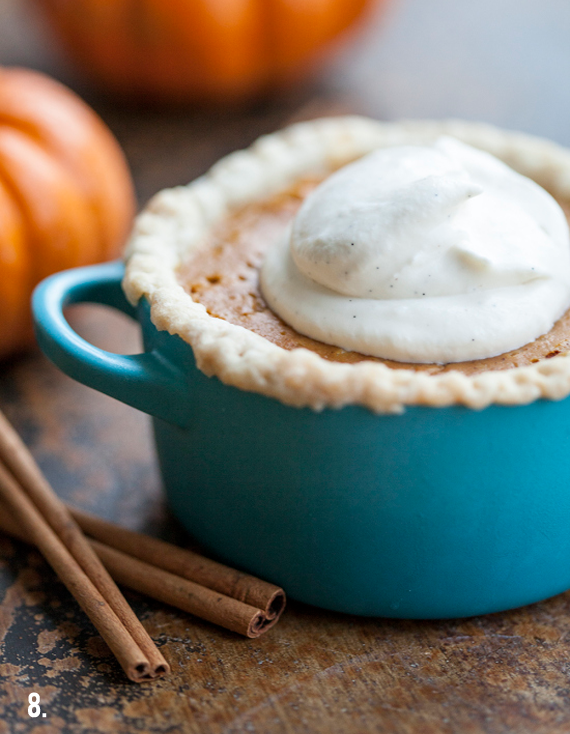 That mini pumpkin pie! Dying! Ok... These all look amazing. This is the first year we have people who are vegetarians at our thanksgiving dinner, and I'm in charge of side dishes... there's a good possibility they will all be from this list! Theres really no one that shouldnt be satisfied with the adundance and variety on Thanksgiving. And if theres not a traditional dish that does it for you, make something nontraditional! Its about being thankful for all we have, turkey or not haha! 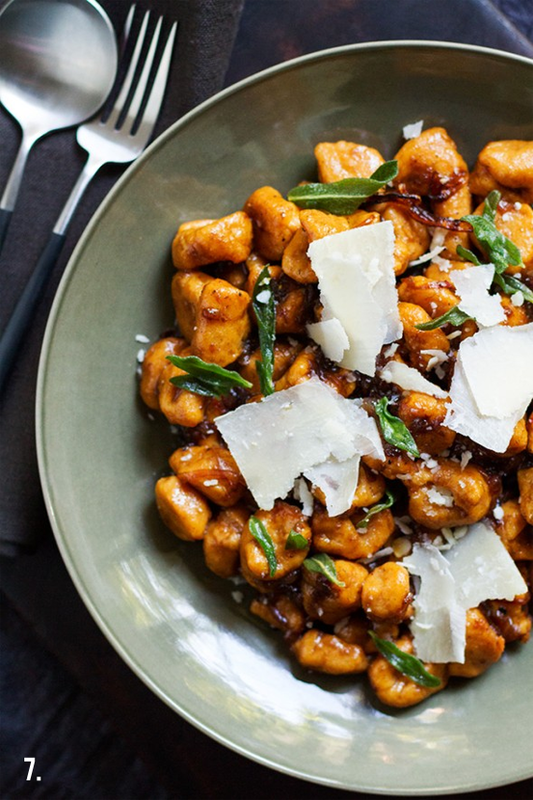 Omg that gnocchi sounds phenomenal! 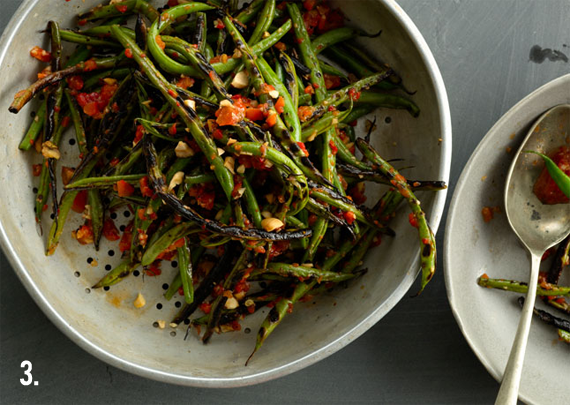 I have fallen in love with the charred green beans, they look like heaven! The gnocchi as well. Bookmarking these! I'm not officially a vegetarian, but I've never been that into meat. I get waaaay more excited about the potatoes and stuffing than any of the birds. The highlight is almost always the pumpkin pie, though! I could eat that for days. Omg everything looks delicious! 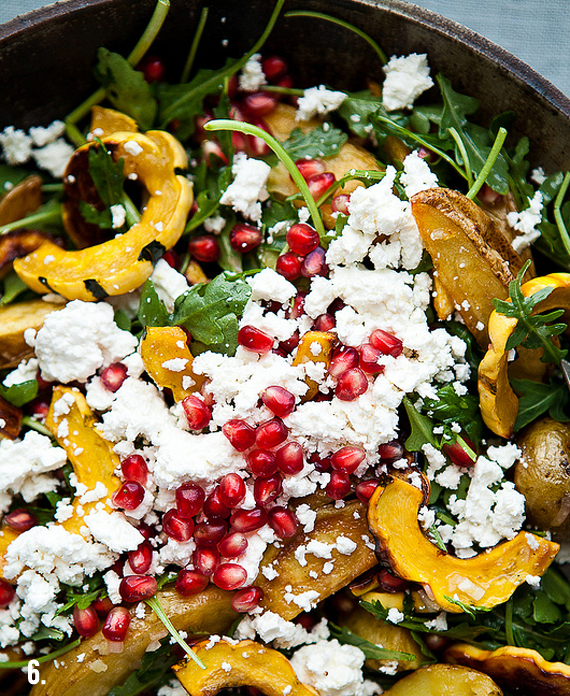 That pomegranate seed salad especially. Hope to see recipes soon! go melissa! based on the title, & photos, i thought this post was going to be done by your sister morgan, the cook extraordinaire. people say the same thing to me about being a vegetarian. i like some mac n cheese with grilled veggies, my mom's homemade rolls, and cherry pie. :) soup is good too. I'm a vegan and I'm looking forward to baking a pumpkin pie and some pumpkin scones for tomorrow! I'm also making some delicious apple sauce. I really find myself difficult to find good recipes as I’m a vegetarian. I was so impressed after I saw this post. Thanks a lot for sharing.